She also slammed the media for reporting some of Manigault’s claims. Manigault’s book is set to be published next week. 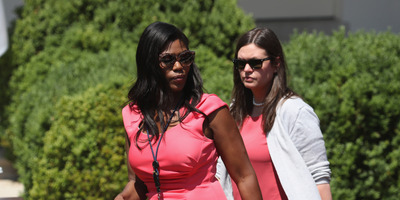 The White House press secretary, Sarah Huckabee Sanders, on Friday said the former White House adviser Omarosa Manigault’s new memoir, “Unhinged,” was “riddled with lies and false accusations,” and she slammed the media over its reporting on it. “Instead of telling the truth about all the good President Trump and his administration are doing to make America safe and prosperous, this book is riddled with lies and false accusations,” Sanders said in a statement. The White House press secretary, who routinely engages in heated exchanges with reporters during press briefings, also focused ire on media coverage of book, which is set to be published next week. It’s “even worse that the media would now give her a platform, after not taking her seriously when she had only positive things to say about the president during her time in the administration,” Sanders said. Several explosive details from Manigault’s memoir emerged Friday. In the book, she is said to cite sources as saying the president routinely used the N-word on tape during his years hosting “The Apprentice,” though she apparently did not hear him say the word. Manigault, who was a contestant on the first season of “The Apprentice,” had a short-lived, tumultuous tenure at the White House; many have therefore questioned the validity of her claims surrounding the president.